« Is your car beyond a spring clean? Why choose J Davidson to scrap your car in Manchester? At J Davidson Scrap Metal Processors we work hard to be the best place to scrap a car in Manchester, with a proper scrap car service that gives you all of the paperwork you need to prove you have disposed of the vehicle legally and absolve yourself of any future responsibility for its whereabouts. This is absolutely crucial in a day and age where car tax and insurance are tracked online and CCTV cameras can instantly recognise the vehicle’s registration plate – potentially leaving you at risk if you hand your car over to a less reputable scrap dealer for disposal. We can collect your car safely and legally from your home, place of work, or even from the roadside, whatever its condition, and transport it to our premises in a way that will not rack up penalty points for you as its licensed driver. We know that money is a big motivator when choosing where to scrap a car in Manchester, which is why we’re careful to make sure we pay the region’s top rates for scrap cars. You can get a scrap car quote just by filling in our online form and telling us a few basic details such as the make and model, engine size, year of registration and general condition – so not only do you get rid of your car in a completely stress-free way, but you potentially make a decent amount out of it too. No matter where your car is in the north-west or what its condition might be, it’s worth at least getting a quote for car or you could miss out on some money or even face paying a garage to come and tow it away. If you decide to scrap a car with J Davidson Scrap Metal Processors, we make the process as straightforward and stress-free as possible for you, starting with collecting the car from wherever it may be, if you are unable to drive or tow it to us yourself. 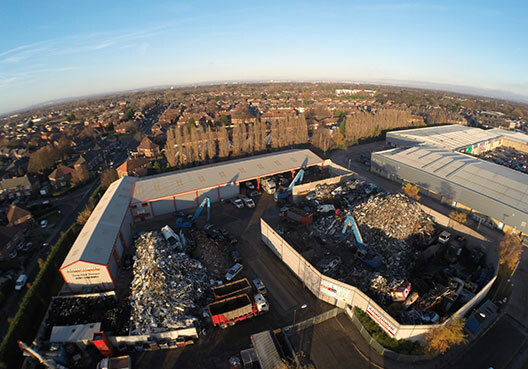 We are an accredited Authorised Treatment Facility (ATF) to process and dispose of scrap cars in line with regulations that came into effect in 2003 – yet despite the years since that time, there are still fewer than 200 ATFs in total across Greater Manchester, Merseyside and Cheshire combined, and we were one of the first. It means we don’t just scrap your car; we carefully dismantle it, removing things like the tyres and battery, and any potentially harmful fluids, so that they can’t pollute the environment. The metal is then recycled, allowing your car to become… anything, really, from a brand new car to all sorts of new metal things, and again helping to use finite natural resources in a sensible and eco-friendly way. Finally, we notify the DVLA and issue you with a Certificate of Destruction so that you are no longer liable for the vehicle’s Road Fund Licence, also known as Vehicle Excise Duty or to most people, simply ‘road tax’.